Preferred citation: Carl Curtis McIntire, Jr. Collection, PCA Historical Center, St. Louis, Missouri. Primary holdings for Dr. McIntire are located at the Princeton Theological Seminary Archives, a very large collection of materials gathered in 1999 from the offices of the now defunct Christian Beacon. At this time, the PCA Historical Center houses a small collection of materials concerning Dr. McIntire, with related materials found in several other collections--see below: Buswell; Stam; Bibliography; References in the Presbyterian Guardian. "The last of the 20th Century's Fighting Fundamentalists has been called to glory. Only eternity will tell of the countless souls rescued from cults and the modernist churches due to the influence of this man" commented Dr. Morris McDonald of the Presbyterian Missionary Union when word began to spread today that Dr. Carl McIntire had passed away late on March 19, at Virtua Health Center in Voorhees, New Jersey. Born May 17, 1906, McIntire was just short of 96 at the time of his death. "An exhaustive preacher, writer, and publisher, McIntire was best known for his motto "A man who will not use his freedom to defend his freedom does not deserve his freedom." 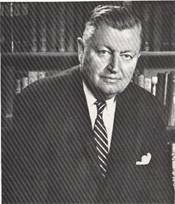 In support of his causes, Dr. McIntire published the Christian Beacon newspaper, preached on the 20th Century Reformation Hour, and at various times directed the American Council of Christian Churches and the International Council of Christian Churches." "Dr. McIntire started his ministerial career in Collingswood and served the congregation there from 1933 for more than 60 years. Under his leadership the church left the Presbyterian Church (USA) as the flag ship congregation of what would become the Orthodox Presbyterian Church, the Bible Presbyterian Church, and a large portion of the Presbyterian Church in America. Though originally partners in supporting the Independent Board for Presbyterian Foreign Missions, Dr. Gresham Machen and Dr. Carl McIntire moved in different directions after the break with the Northern Presbyterian Church. Machen became identified with Westminster Seminary while McIntire developed Faith Seminary." "According to Bible Presbyterian sources Dr. K.C. Quek, the General Secretary of the ICCC will fly from Singapore to participate in the funeral which is scheduled for March 26 at 1 PM in the Bible Presbyterian church of Collingswood, New Jersey." The son of a Presbyterian pastor, Carl Curtis McIntire was born on May 17, 1906 in Ypsilanti, Michigan during his father's first pastorate. The little that is known about his early years is gathered in bits and pieces. His father, Charles Curtis, was a Princeton Seminary graduate, class of 1904. Leaving his first pulpit in 1907, he next pastored the Westminster Presbyterian Church of Salt Lake City from 1907 - 1910 and then served as the executive secretary of the Presbyterian Laymen's Foreign Mission Movement from 1911 - 1912. By 1912 however, Charles Curtis McIntire had suffered a mental breakdown and was hospitalized. Details of this setback are lacking, but for whatever specific reason, Carl's mother Hettie divorced and raised her sons Carl and Blair alone in Durant, OK. (According to an article several years ago in the Philadelphia Inquirer, there may also have been at least one other brother in the family, Forest McIntire, who was located in Oklahoma City). During these years Hettie McIntire worked as the Dean of Women at the Southeastern State Teacher's College in Durant in order to support her family. By 1920, Charles Curtis had recovered and was serving as the pastor of the Presbyterian church of Vinita, OK, as a lecturer and as a prison evangelist. He died in 1929. Carl McIntire graduated from Park College, Parkville, MO in 1927 and attended Princeton Theological Seminary from 1928 to 1929. McIntire was among those who left Princeton in protest over a reorganization of Princeton Seminary that left modernists in control, leaving to follow J. Gresham Machen and others who then quickly founded Westminster Theological Seminary. Graduating from Westminster in 1931, he was ordained by the Presbytery of West Jersey (PCUSA) and his first pastorate was at the Chelsea Presbyterian Church of Atlantic City, NJ. In October of 1933 he became the pastor of the Collingswood Presbyterian Church, Collingswood, NJ. McIntire was among the founding members of the Independent Board for Presbyterian Foreign Missions (IBPFM), a conservative agency started by J. Gresham Machen in opposition to the observed theological decline in the Foreign Missions Board of the Northern Presbyterian Church. But by 1934, the General Assembly of the PCUSA declared that participation in the IBPFM was unconstitutional and Machen, McIntire and others involved with the IBPFM were ordered to resign or face charges in the ecclesiastical courts of their Presbyteries. Like Machen, McIntire was suspended from the ministry in 1935 and the suspension was later upheld by General Assembly. Suspension included exclusion from the pulpits of the denomination and excommunication from the Lord's Table. Thus forced, Machen led a small group of pastors and laymen in the formation of the Presbyterian Church of America in the summer of 1936. A lawsuit by the PCUSA charged a conflict of interest and the fledgling denomination had to quickly change its name, taking the title Orthodox Presbyterian Church. McIntire was thus a founding member of the OPC, but the new denomination was immediately beset with arguments over the issues of premillennialism and abstinence. By the end of 1937, following Machen's death early that same year, McIntire and a twelve other pastors within the OPC had left to establish yet another Presbyterian denomination, taking the name Bible Presbyterian Church. Within this newest group, McIntire's church was easily the largest, with some 1200 members. This support base allowed for a diverse number of ministries, including the publication The Christian Beacon, which began in 1936 and which operated as a journal of record for the Bible Presbyterian Church for many years. In 1937 McIntire founded Faith Theological Seminary, aided in part by the assistance of then-student Francis A. Schaeffer. By the start of American involvement in World War II in 1941, McIntire had seen the need to get conservative men into the military chaplaincy. The American Council of Christian Churches (ACCC) was started to represent Biblically conservative churches. As the chaplaincy was then run on a quota system, McIntire worked to increase the numbers of people represented by the ACCC. His success in this work allowed many conservatives into the chaplaincy, but this same success later led to excess, and by 1955 the Bible Presbyterian Church was in turmoil over charges that McIntire was inflating the membership numbers of the ACCC. Those charges were leveled by Francis Schaeffer and Robert G. Rayburn, among others, and in reaction McIntire led a small group of stalwart followers out to form a competing Bible Presbyterian Church while the larger original group carried on for a few years under the same name and eventually merged in 1965 with the Reformed Presbyterian Church to create the Reformed Presbyterian Church, Evangelical Synod (RPCES). While the RPCES joined the PCA in 1982, McIntire's Collingswood Synod wing of the Bible Presbyterian Church was split yet again in 1984 with another division that saw McIntire leading out a still smaller number of followers. Our record of the story largely ends at this point, based upon the materials that are here at the PCA Historical Center. The story of Carl McIntire is truly deserving of a longer work, and could never be properly told in such limited space. He was a brilliant man, gifted, able to accomplish much in life, a controversialist and a skilled propagandist, and a man who suffered from a number of fatal flaws that eventually undid much of his life's work. 332.20—McIntire, Carl, 1935, Dr. Robert E. Speer, the Board of Foreign Missions of the Presbyterian Church in the U.S.A. and Modernism, 96pp. • The New Bible [Revised Standard Version]: Why Christians Should Not Accept It, undated, 23pp. • The Truth About the Federal Council of Churches and the Kingdom of God, 1950, 29pp.